Building upon the well-deserved hype of the original Bronson (1.0), the Santa Cruz Bicycles Bronson 2.1 C S Complete Mountain Bike boasts a completely new VPP® link arrangement that enhances lateral stiffness, better small bump sensitivity, and a more progressive mid-stroke. A refined geometry also yields a one-degree slacker 66° head tube angle and a shorter chainstay for an even more rally-ready rig! The lightweight yet proven C(arbon) frame is built out with quickly-adaptable Fox front/rear suspension, a SRAM GX Eagle™ 1x12 drivetrain, and a RockShox Reverb remote-actuated dropper seatpost. 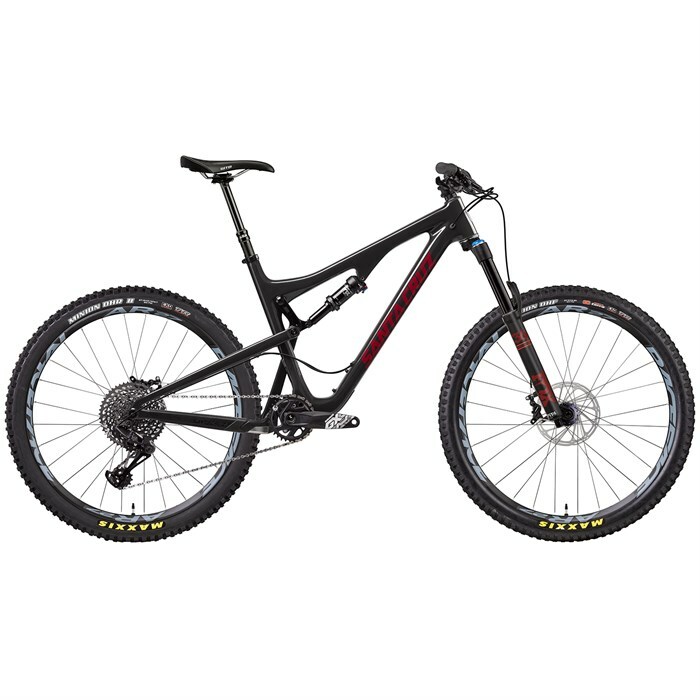 If you're looking for a bike that checks all the boxes in a variety of conditions, the Santa Cruz Bicycles Bronson 2.1 C S Complete Mountain Bike may very well be your best bet! 150mm VPP® Suspension  VPP is based on the patented principle of having two short links rotating in opposite directions. This system provides huge design flexibility, allowing Santa Cruz to manipulate shock rates to the intended purpose and character of each model; from short travel endurance bikes to World Championship winning DH machines. Fox Float Performance DPS  For a lightweight, inline shock, the DPS packs a lot of performance. The Dual Piston Base Valve has dedicated compression and rebound pistons, providing a firm lockout without compromising bump compliance, ride control, or efficiency. Performance Series FLOAT DPS shocks have fewer adjustments than Factory Series (no Open mode adjust tuning range), and have black anodized air sleeve and body instead of Genuine Kashima Coat. A Performance graphics package ties in the black-on-black look. Minor 2.1 Frame Update  Front derailleur hanger removed from frame for a 20-30 gram weight saving. Frame and geo otherwise unchanged. Fox 36 Performance Fork  Performance forks retain the same black anodized 7000 series aluminum upper tubes as Performance Elite, but have a different damper (FIT GRIP) with fewer adjustments. SRAM GX Eagle™ Drivetrain  SRAM Eagle™ drivetrains are the only 1x drivetrains that are fully system engineered for optimal performance. Eagle™ drivetrains are designed, tested and proven to deliver the lightest, highest-performing, most durable systems for all riders on any trail. Eagle™ technology provides an expanded, optimum, gear range that allows you to realize your bike's potential beyond where it has ever been. Every SRAM GX Eagle™ component is 100% compatible with all levels of SRAM Eagle™ drivetrain systems. SRAM Guide R Brakeset  What's it going to take to ride that line? It's steep. It's rocky. You've passed it a hundred times. But not this time. With the all-new SRAM Guide R, you have the power. Proven 4-piston calipers give you smooth, one-finger control. Features like Reach Adjust let you dial it in just right. And Guide perfectly complements other SRAM components and gives you flawless performance on every ride. Now featuring the World Championship-winning S4 caliper with Bleeding Edge™ and Heat Shield technologies. RockShox Reverb Stealth Dropper Seatpost  Don’t let its familiar good looks fool you—Reverb is a whole new weapon. Its internals have been completely re-engineered to improve on its already legendary performance and to offer enhanced reliability: all the smallest details, down to the single seal, have been re-evaluated and updated to pass the hardest and longest durability tests. Additional bushing overlap also improves performance over time. This is the brand-new Reverb, engineered for the next-generation mountain biker. Limited Lifetime (Frame+Bearings Only) Visit https://www.evo.com/warranty-policy for more info.